Until I was 17 years old, I thought there was only one thing you could make with lentils: mujjadra - a slow cooked Lebanese dish, loved (and hated) by many. When I finally finished high school and was old enough to venture out into Sydney city on my own, I discovered that lentils didn't have to be overcooked to the point of becoming brown and unrecognisable. I saw them in salads and hot lunches everywhere, especially in vegetarian eateries. Plenty, a Cook Book by Yotam Ottolengh has fast become my favourite vegetarian cookbook. Big on flavour and Mediterranean influence, this cook book is exactly as the name suggests: that without the use of meat and flesh foods, we still have access to plenty of good, wholesome and tasty ingredients that are more than enough to live a tasty, healthy life. A simple, beautiful concept. What I find most interesting is that Israeli born chef Yotam is not a vegetarian, but has created this anthology as a means of drawing both vegetarian and meat eaters around the same table to enjoy flavourful meals. The strong influence of Middle Eastern flavours is something that I have been able to connect with deeply. Plenty continues to inspire me with nostalgic recipes, as well as tempting me with flavour combinations I'm yet to experience. is my version of a gorgeous recipe in Plenty. I simply replaced onion with rocket, and gorgonzola with feta, as well as adding some lemon juice to the mix. What I love most about this cookbook is that nothing comes off as rigid and unapproachable, instead the recipes are so versatile and adaptable; just the way healthy eating should be! First make the the Balsamic Reduction: In a small saucepan, mix balsamic and sugar together and bring to boil over medium heat. After reaching boiling point, simmer on low heat for abut 15 minutes, or until the mixture has reduced to about half a cup. Cool prior to using. Preheat your oven to 150 Degrees C and arrange the tomatoes on a lined baking sheet. Remove the tomatoes from the oven, and set aside to cool. Drain the lentils and place them in a large mixing bowl. Add the olive oil, rocket, crushed garlic, salt, freshly-ground pepper, and lemon juice to the lentils and mix well . Let the mixture cool slightly before adding the herbs and continue to mix to combine. Add salt to your liking. 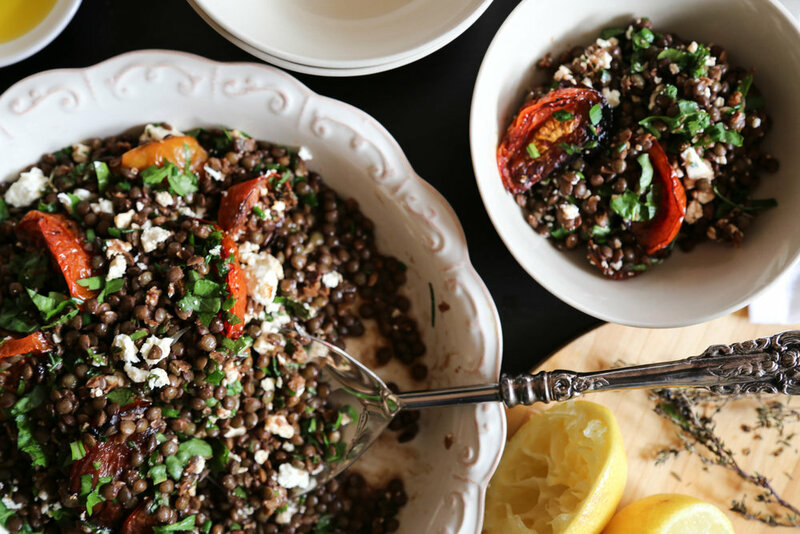 Arrange the lentils on a serving dish and top with tomatoes and crumbled pieces of cheese. Pour the pan juices accumulated from the roasted tomatoes on top. Enjoy!